Its non-linear story is The Witcher 2's "ultimate feature," says developer CD Projekt. CD Projekt senior producer Tomasz Gop said the developer had created a "tailor-made engine" for The Witcher 2, so that it could tell the story the studio wanted to tell without being constrained by the aging Neverwinter Nights engine used in the first game. Speaking at this weekend's Eurogamer Expo, Gop said that the engine had been written from scratch, allowing CD Projekt to enhance the game in all areas. This had given the studio the ability to build things on a much larger scale than before, he said, for both locations and encounters. 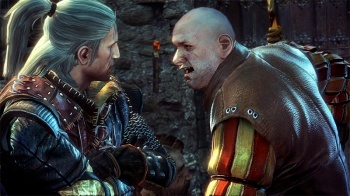 To illustrate the abilities of the new engine, Gop showed off the prison break trailer from last week, which saw lead character Geralt escaping from a prison in a variety of different ways and demonstrated The Witcher 2's non-linear gameplay in the process, and then a previously unseen "cursed battlefield" with hundreds of ghost soldiers roaming it at the same time. Gop said that The Witcher 2 will be a story-driven game that will be around the same size as the first one, supposedly around 80 hours of gameplay. He also said that the fetch quests that made up a significant portion of those 80 hours in the first game have been scrapped, and that the game will be "more intense" overall. The Witcher 2 will be released for PC some time in 2011, although CD Projekt does want to bring the game to consoles as well.